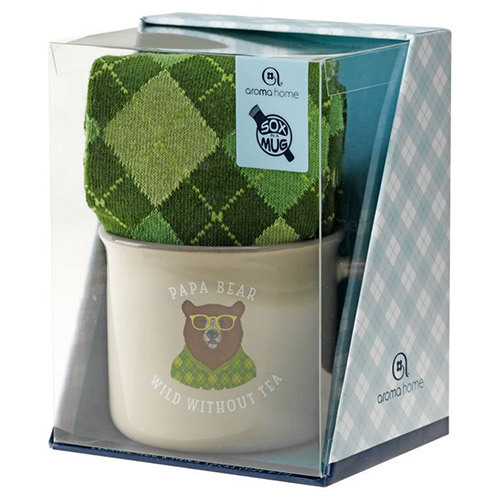 Introducing the Aroma Home Sox in a Mug - Papa Bear. A printed design of a bear on a ceramic mug with super-soft fluffy socks. Perfect for morning cups of tea or cosy evenings. The cosy socks are made with cotton and polyester and are sure to keep your toes toasty. A great gift for coffee and tea lovers everywhere. Below are reviews of Aroma Home Ceramic Mug & Men`s Socks - Papa Bear by bodykind customers. If you have tried this product we'd love to hear what you think so please leave a review.